Whether you want to play the favorite music of mobile phone by home audio speaker? Or Listening to phones' songs by car? 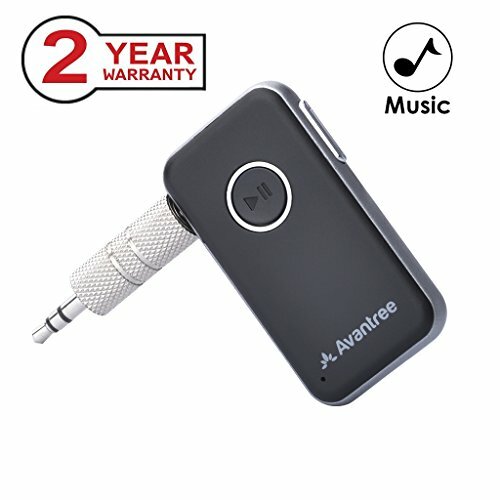 If so, Avantree bluetooth aux receiver can help you. It is compatible with all Bluetooth enabled phones. We offer 12 Months Warranty for normal use. Live online support, Telephone Support, and email support are available. Video user guide are available also from Avantree site. Any issues or suggestions, contact us via our US toll free No, Intl number, OR email us and 1 working day reply is guaranteed. We are committed to 100% customer satisfaction. IDEAL FOR AUTOMOTIVE USE: Place this Bluetooth receiver into your car audio AUX (3.5mm) input; then stream audio from your Bluetooth enabled phone or other audio device. BLUETOOTH-ENABLE YOUR HOME WIRED DEVICES: Integrate your phone to your home by connecting this Bluetooth receiver to your wired speakers / headphones via included 3.5mm audio cable / adapter. Then pair it with your phone for high quality music and calls. DOUBLE LINK: Connect with two mobile phones at the same time. Easy to switch between your favorite music and an incoming call. Never miss a call again. EASY CONTROL: Simply adjust volume, play and pause music, or answer phone calls on this receiver without using the smartphones.